Budget travelers staying at the Hotel Tempi have an added bonus to the low price they paid. 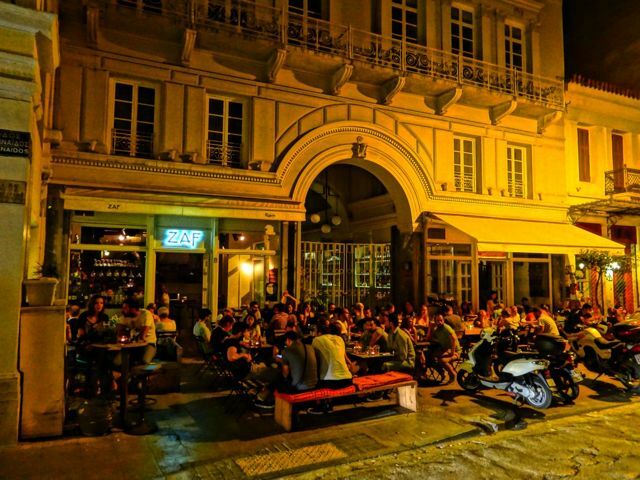 The hotel is located in the center of one of the most lively areas of Athens, day or night. The square at Agia Irini used to be home to the flower market of Athens but all but one or two have disappeared as have many of the other shops on the platia and surrounding streets. 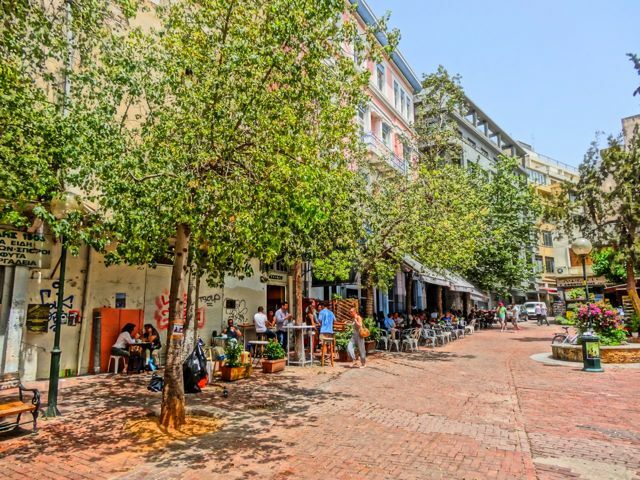 They have been replaced by cafe-bars that are filled with coffee drinkers by day and wine, beer and cocktails at night when the neighborhood literally buzzes with the sound of voices and music. The cafés also serve food and you can get anything from breakfast to a snack to a whole meal more like a French bistro than what you would expect in Greece. On Aeolou Street, an important pedestrian thoroughfare that connects the Plaka and Monastiraki with the market and Omonia (the easiest way to walk to the National Archaeological museum is by going straight down Aeolou to Patission) there are several good restaurants including one of my favorites; Mama Roux, and the traditional yet modern Kouzina Manas right by the church. 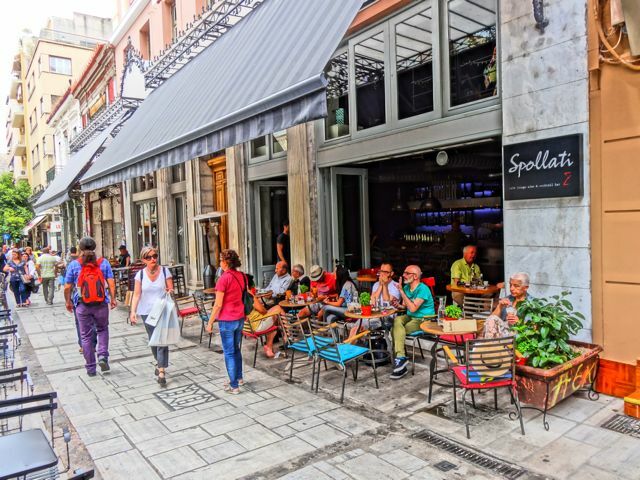 Have a coffee at Spollati and watch the shoppers pass by on their way to and from the market or the various clothing, hardware and other shops in the neighborhood or if you want less hustle and bustle try Rooster or one of the cafés behind the church. For my money the best spot is Tailor Made or Throubi which share the ground floor of the same historical building right on the square. ( I prefer the chairs at Throubi. They both make great coffee.) Right next door is Kostas, said by many Athenians to be the best Souvlaki shop in Athens where you will find lines of Greeks, not tourists, waiting for their economic crisis lunch. 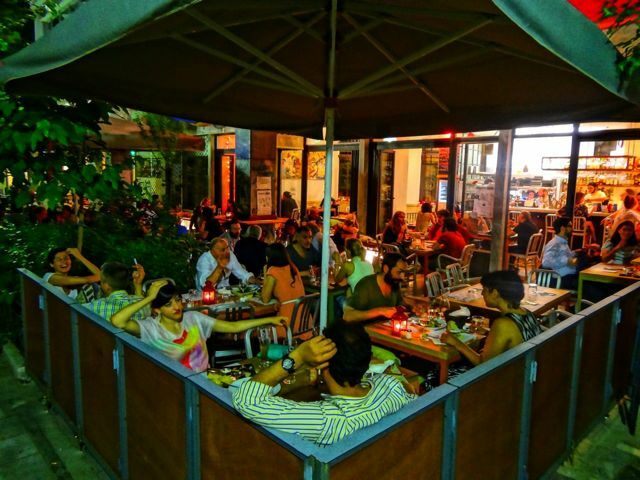 For the college age looking for live music and action go to a small street called Avramitiou where there is a very cool collaborative collection of bars and cafes called 6 D.O.G.S. usually with at least one or two live bands playing. On weekends the street is packed with young people. If you stand in the square you will see that you are surrounded by impressive old buildings, some of which were historic hotels. That is because in the mid 19th century Platia Agia Irini was one of the most important squares in Athens, back in the days when the church of Agia Irini was the main cathedral of the city before they built the large (and unstable) Metropolis a few blocks away halfway between Syntagma and Monastiraki. To some Athenians Agia Irini is still the first cathedral and have never accepted its displacement. 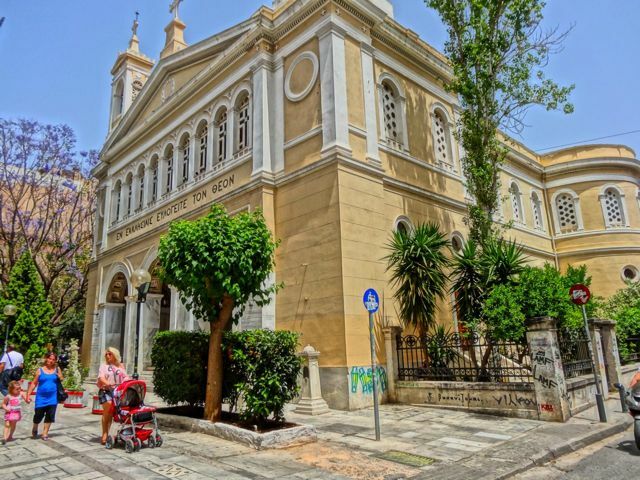 Take a few minutes and go inside the church and you will find one of the most beautiful examples of a Greek Orthodox Church based on the Byzantine style. ("Sorry: No Photo"). The church replaced a smaller Byzantine church which like many churches in Greece replaced an ancient temple, and like many of these churches the ancient stones were incorporated into the new building. My friend Adam Cohen, a popular Canadian singer and son of a well known poet, told me that when he arrives in a city he likes to wander around and get the pulse of the area. 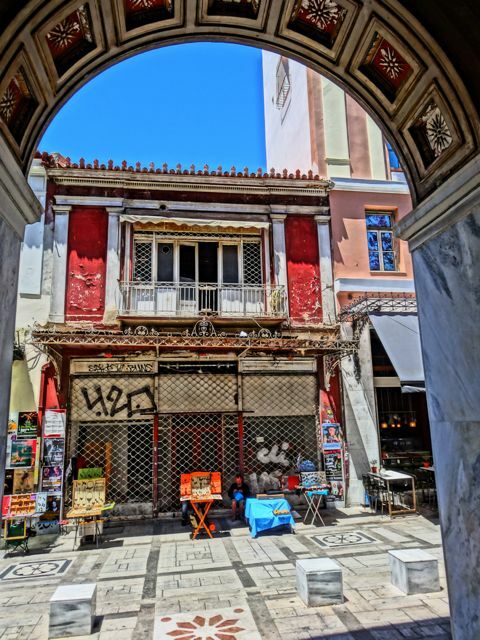 When he discovered the square at Agia Irini he realized that despite the crisis, the pulse of Athens was strong and he felt good about The Future. 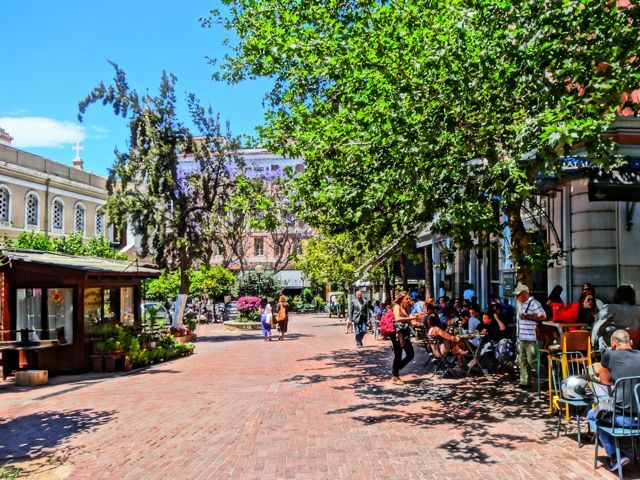 If you want to feel good about the future while feeling good in the present in an area that is very Greek, yet steps away from the well trodden tourist footpaths, make some time for a visit to Platia Agia Irini, at whatever time of day you have to spare. 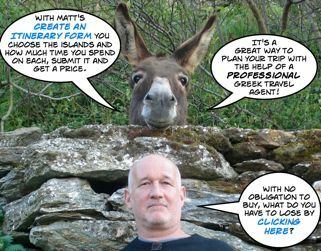 To find Agia Irini is very simple. 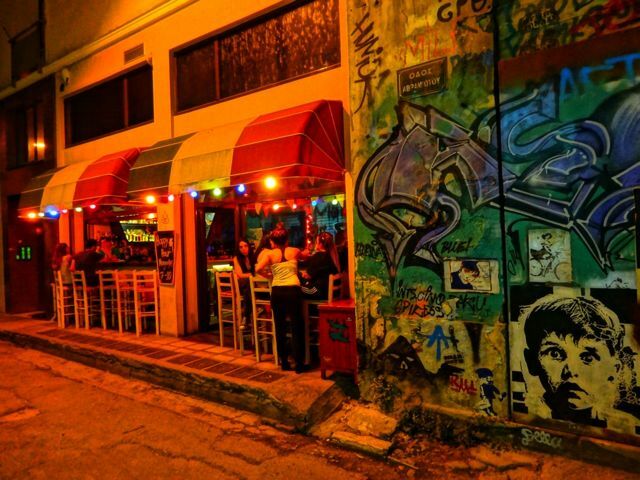 Just find Aeolou Street and walk away from the Acropolis. If you come to the giant Dimarchos Square you have come too far so turn around and go back. 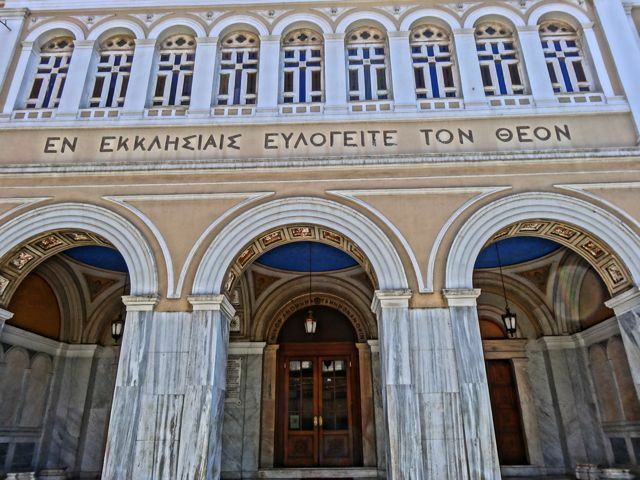 It is on Ermou between Kolokotronis and Perikleos Streets though the latter changes names about 5 times between Syntagma and Athinas Streets which can get confusing. 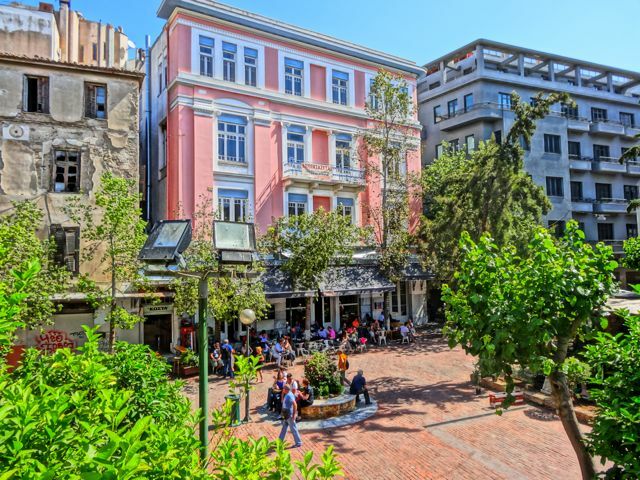 My first choice in this area, and really in my opinion the best economy hotel in Athens is the Hotel Attalos which is just two blocks from the Monastiraki metro station. A little further is the Hotel Cecil which is also an economy hotel, though in an old historic building. 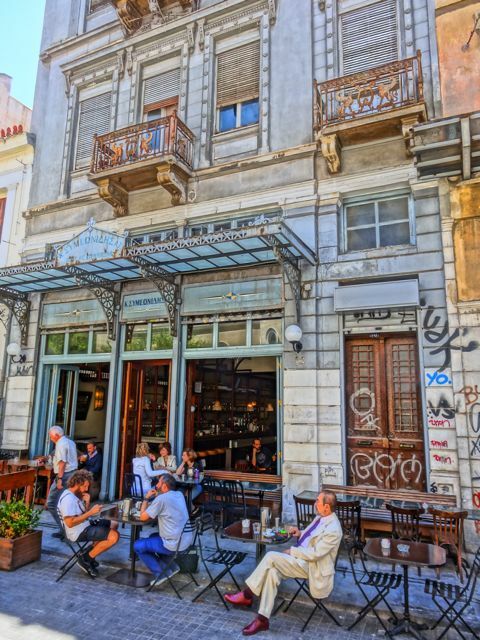 The Boutique Hotel A is for Athens actually overlooks Monastiraki Square. 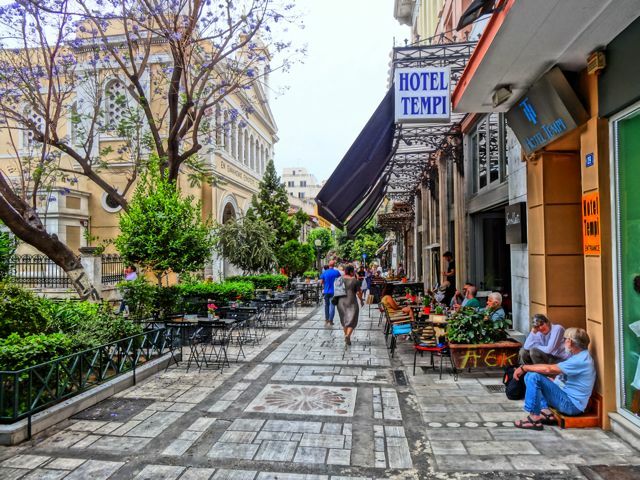 The Hotel Tempi which is on Aeolou is also a budget hotel and is right on the square as is the beautiful Emporikon Athens Hotel which reopened after 100 years! The Athens Style Hotel in Psiri which is something of a hostel though you can get a double room if you want. The only 4-star hotels in the area are the Hotel Fresh which is in the Central Market (where Jamie Oliver stayed when he filmed his episode in Greece and cooked on a hibachi on their roof), and the 2-star Economy Hotel which is just around the corner and much less expensive and has a nice rooftop bar with a view. The 3-star Arion Hotel is in Psiri just a half a block from Athinas street and close to several good restaurants.